It’s probably the last thing we touch when we leave the house, and it’s probably the first thing we encounter on our way in. 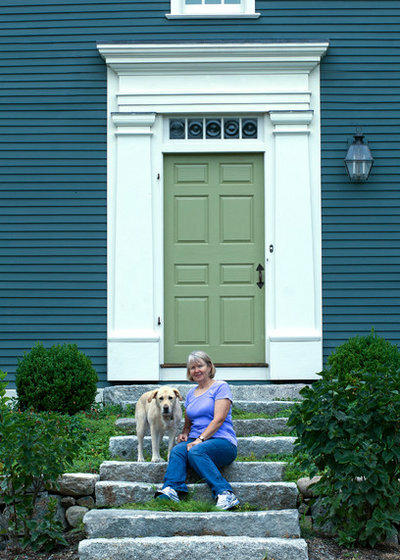 No matter where we live, we all have and frequently use a front door. 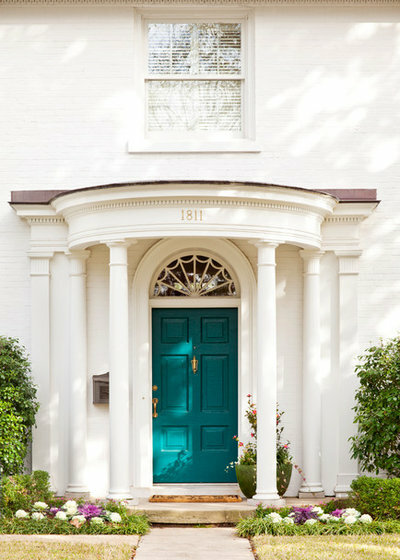 This collection of front doors and entryways shows us 77 different ways to celebrate those daily run-ins; some are bursting with color, and others showcase subtle but intricate details. Click the first photo to get started, and tell us which door you’d like to walk through every day. 1. 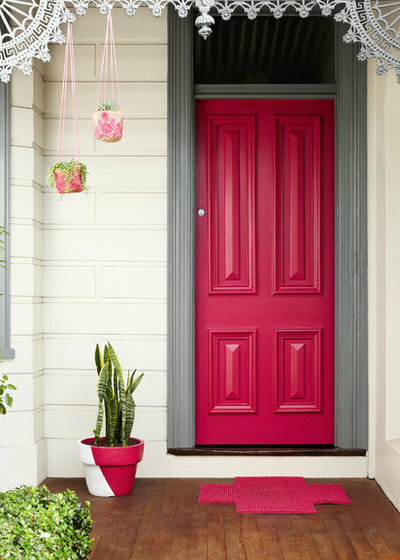 Colorful containers match the charming pink front door of this home in Australia. 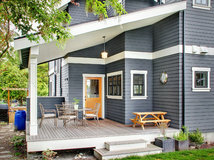 Neutral trim and siding balance out the look, making for a entry that isn’t too fussy or over-the-top. 2. Rough-sawn Douglas fir continues from the front-door overhang into this midcentury home in California, creating a smooth transition from the outdoors in. 3. 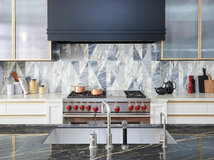 These double metal doors are coated in an Axolotl finish called Graphite Viper Torn, made of a liquefied semiprecious metal. 4. 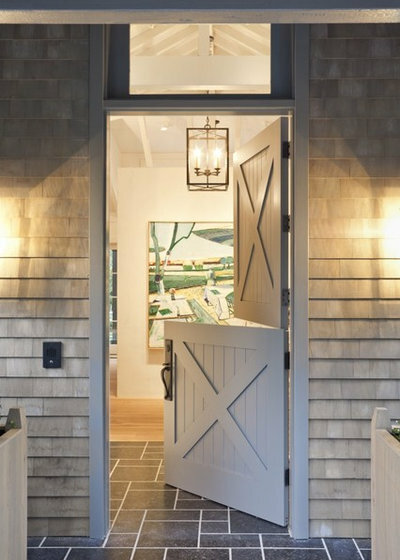 The white front door in this Cape Cod-style home doesn’t try to steal the show. 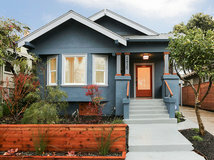 The bold copper trim and rain gutters stand out instead. 5. 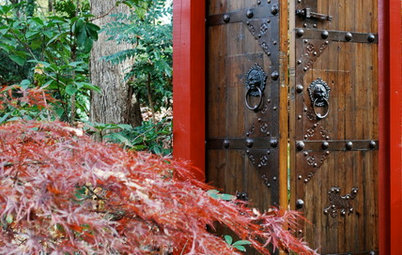 The metal details and rich wood tones of this salvaged door create an entry that’s just as vivid as one in a bright color. 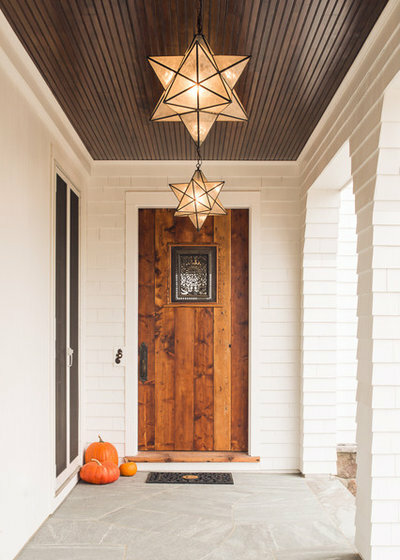 Moravian star pendants line the walkway. 6. 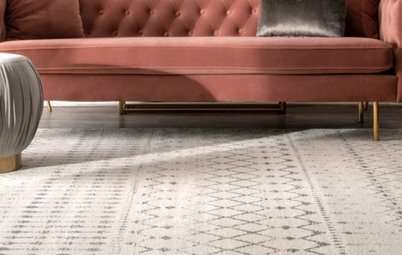 Paris meets Denver in this elegant entryway. 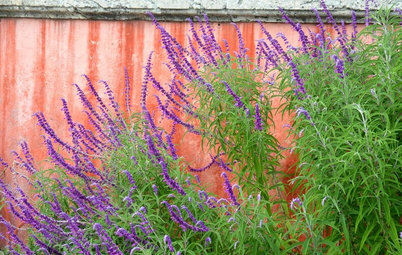 Designer Linda L. Floyd had the two planters and antique awning shipped from France. 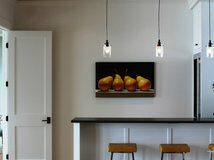 She custom designed the door for this project. 7. 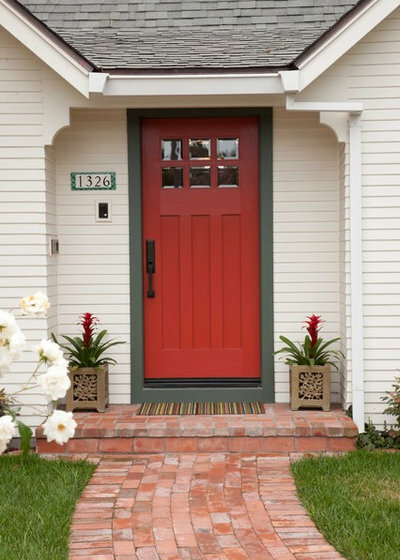 Red bromeliads, a walkway of aged brick and a warm red door add to this clean and classic front entry in San Diego. 8. This restored historic home in San Diego features details and accents that reflect its age and heritage. 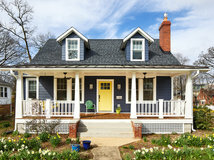 Tiled walls and a heavy wood door welcome homeowners today, as they have over the decades. 9. 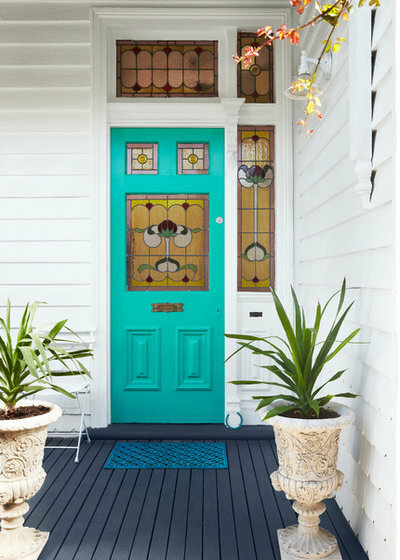 High-gloss turquoise picks up hues from the stained glass on this door, creating a balanced mix of tradition and modernity. 10. 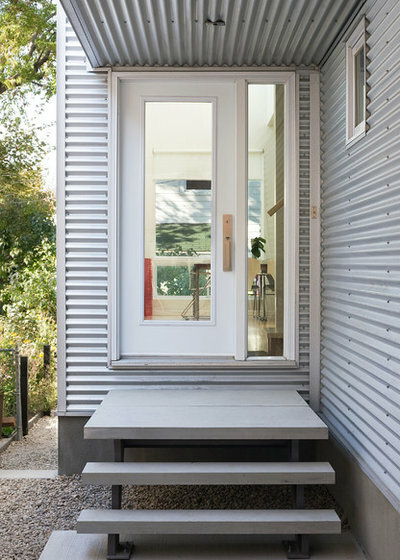 The projection of this front door’s overhang and concrete stoop instills a feeling of movement, even though everything is standing still. 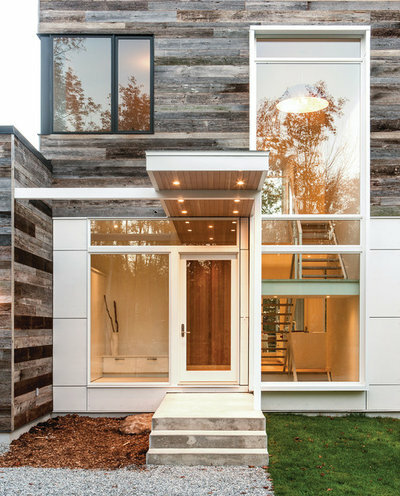 The glass door blends with the expansive glass of the entry windows. 11. You can decorate the front door even if it isn’t a holiday. 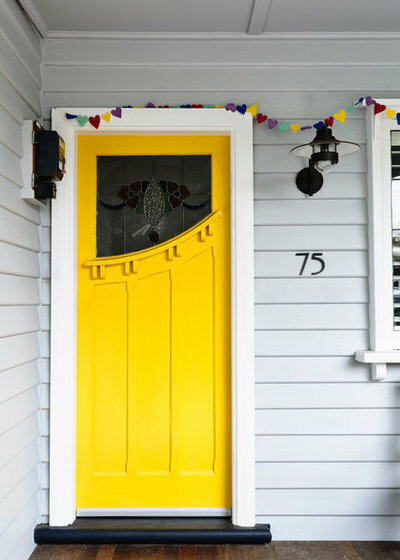 This sweetheart garland paired with the yellow front door creates quite a warm invitation. 12. 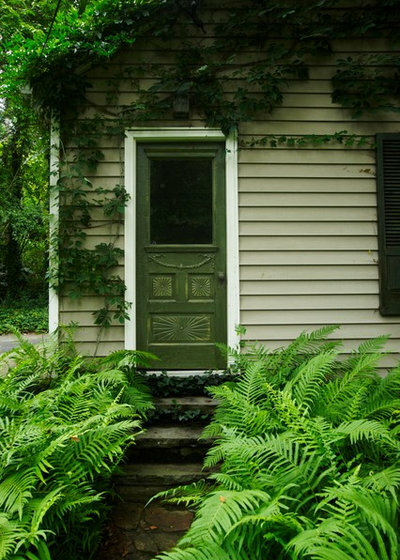 Lady ferns (Athyrium filix-femina, USDA zones 4 to 8; find your zone) frame the walk up to this distressed green door, which is awash in a sea of green. 13. 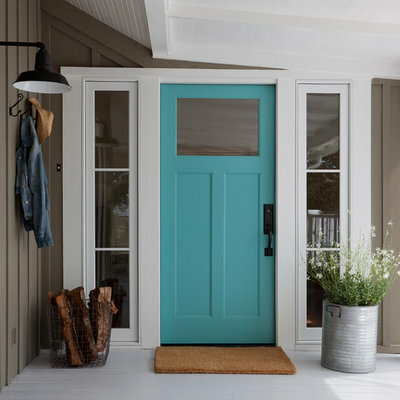 Designer Beth Dana created this custom turquoise color as a contrast to the otherwise earthy, neutral exterior, giving visitors a taste of what they’ll find inside. 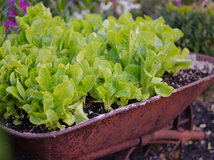 The sconce is by Barn Light Electric Co., and the metal crate and planter are from Industry Home, a store in Santa Barbara, California. 14. 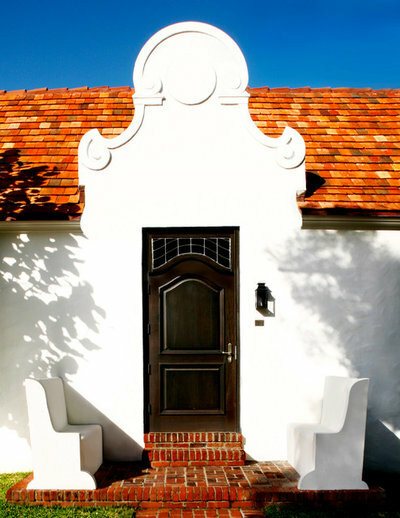 Built-in benches and ornate stucco work surround the dark wood front door of this restored 1920s home in Coral Gables, Florida. 15. 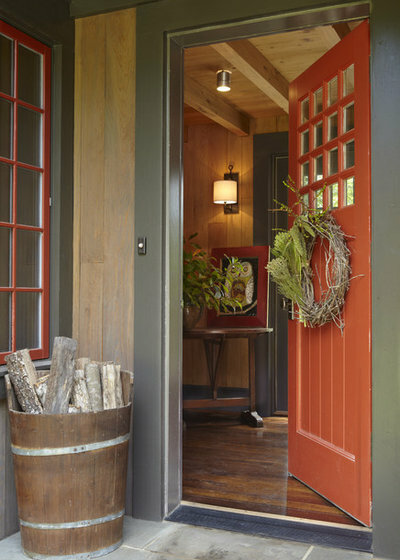 This Alabama cabin’s front door and window frames painted in a custom red pop against a palette of rich woods and dark trim. 16. 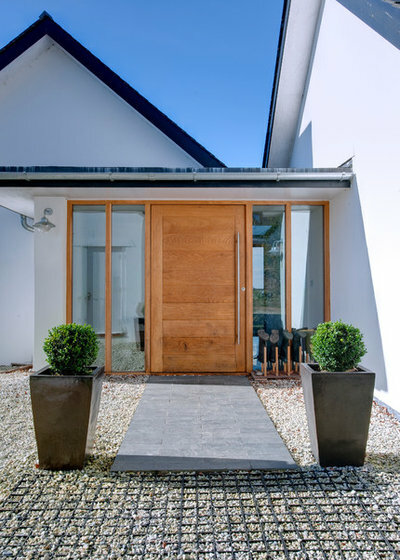 A custom pivot door and handle stand out against this modern gable home in Cornwall, England. 17. 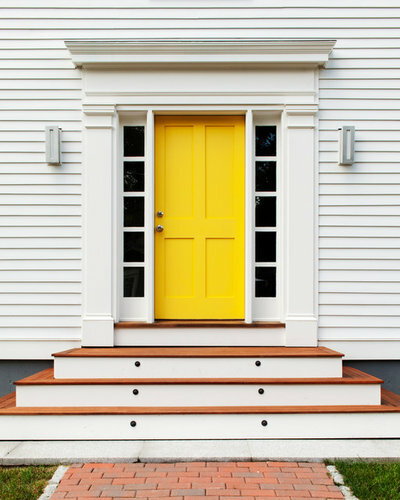 This cheery farmhouse entrance features mahogany steps and a bright yellow door that strikingly contrasts the crisp white siding. 18. 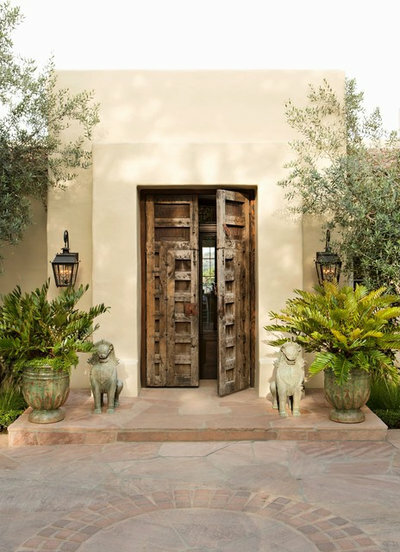 Flagstone and gravel lead to a warm and inviting entry in this Spanish Revival home in Los Angeles. 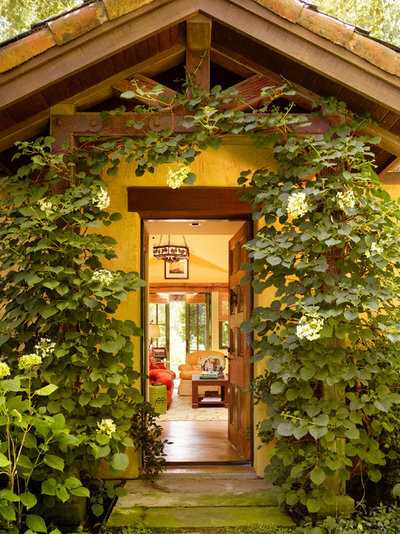 The golden yellow exterior mixes well with the green front door, which picks up the hues in the pathway’s foliage. 19. 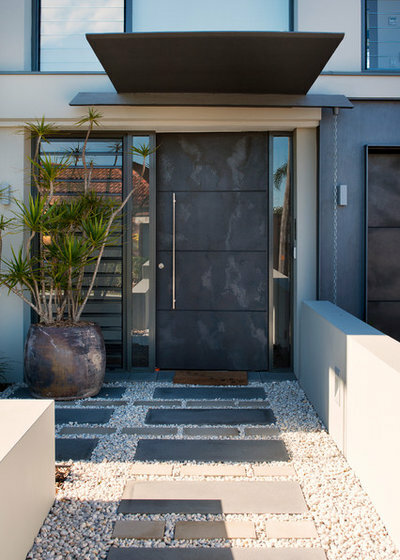 An overall neutral but textural exterior points visitors to this bold front door. 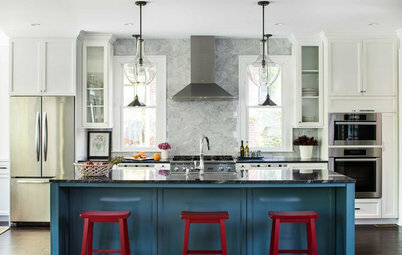 The custom color, by Glidden, was mixed to match the red in the Italian pot next to the front door. 20. Concrete stepping stones, pebbles and papyrus create a Zen-like entry experience for this Los Angeles home. 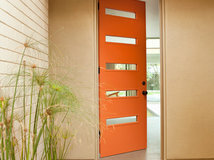 The bright orange door interrupts but also complements the overall neutral color scheme. 21. 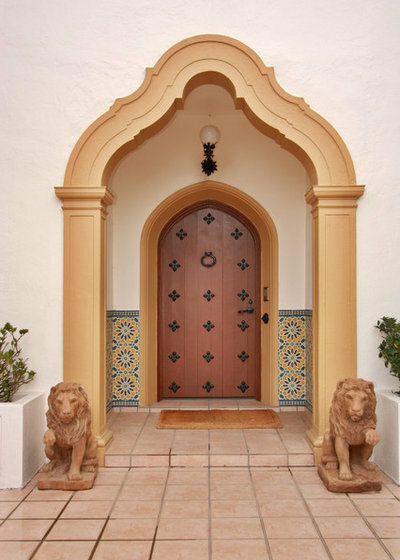 A vintage door from Central America marks the entrance to this Mediterranean home in San Diego. 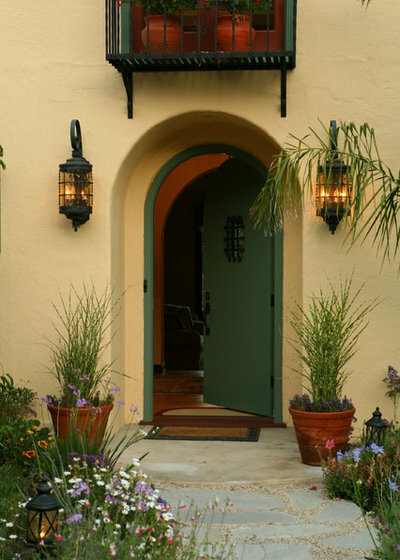 Matching lanterns, sculpture and potted plants enhance the elegant entry. 22. 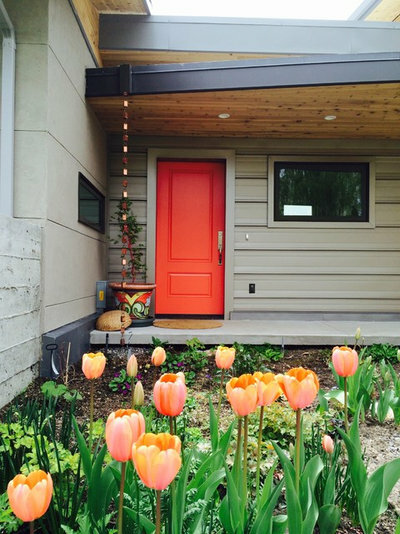 Though often used as a back door, a Dutch door makes for an inviting and versatile front door. 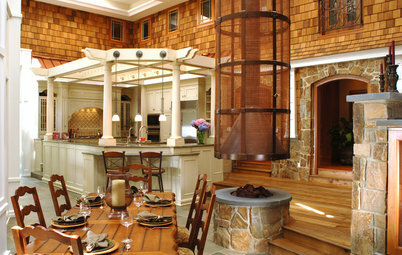 This one was custom-made by Curtis & Sons Door, and the lantern is by Phoenix Day. 23. Cut limestone steps lead to a simple industrial entryway. 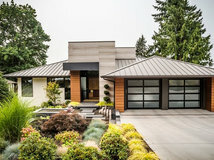 Corrugated metal siding creates a humble yet modern enclosure. 24. Architect Erik Peterson designed the gabion column leading to this glass and metal front door in Arizona; the metal cage filled with stones surrounds an interior support column. 25. 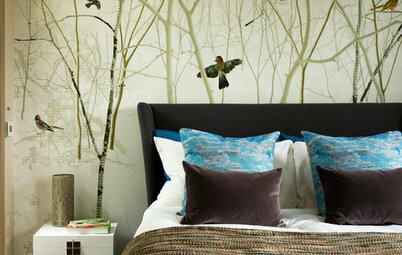 Black can be an intimidating color to commit to, but few colors create a more elegant and dramatic look. 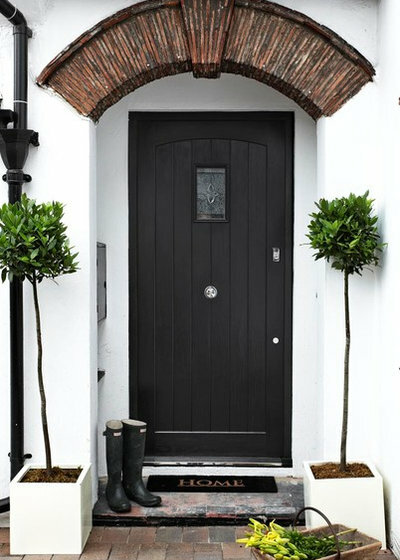 Here black, white and brick keep the entrance simple, uncluttered and classic. 26. 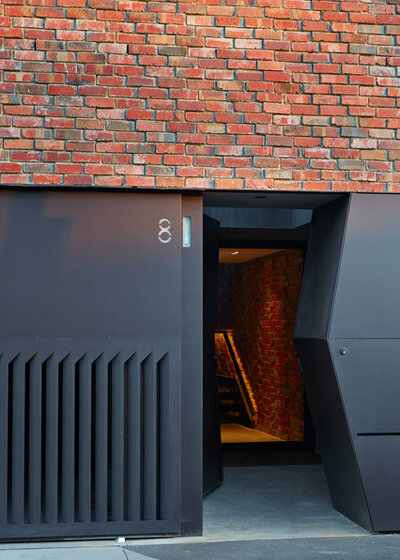 This industrial entry in Melbourne, Australia, by architecture firm Jolson, resembles a portal more than a front door, but it just goes to show there are countless ways to enter a house. 27. 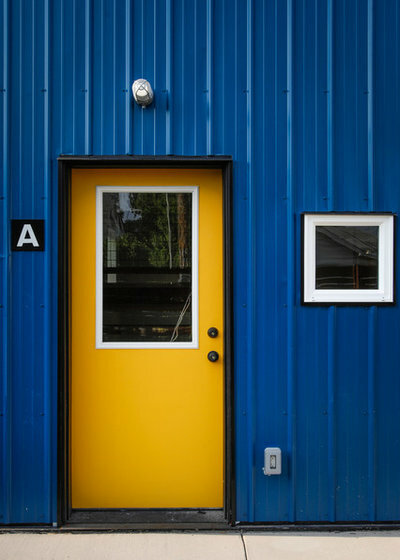 Twenty-eight-gauge steel painted a stock color contrasts the sunny yellow of the front door. Builder Christopher Chitty appreciates how warm and inviting yellow is, especially in low light, when everything else fades to darkness. “It begs to be an entry,” he says. 28. 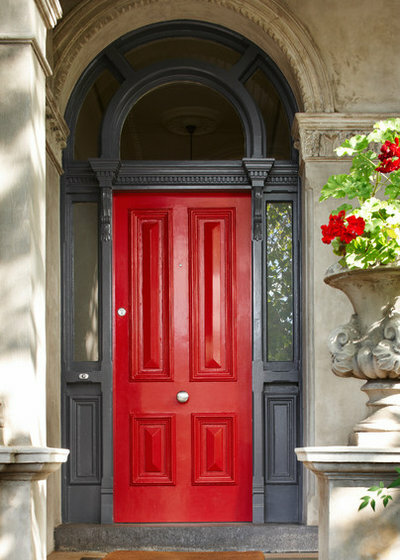 High-gloss red and dark gray create a high-impact entrance in this traditional Melbourne, Australia, home. 29. Designer Alison Damonte bought this owl umbrella stand at a flea market and repurposed it as a planter for a staghorn fern. 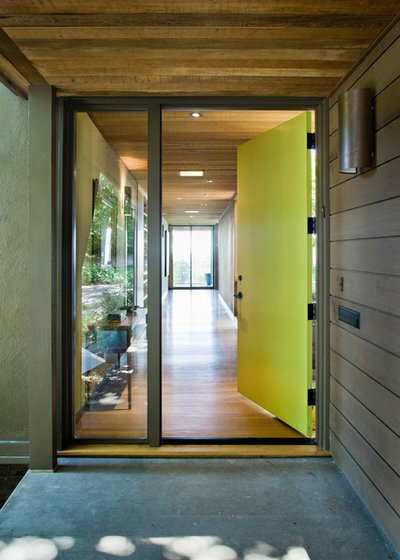 The lime front door invites visitors into a colorful Eichler home, which is in the San Francisco Bay Area. 30. 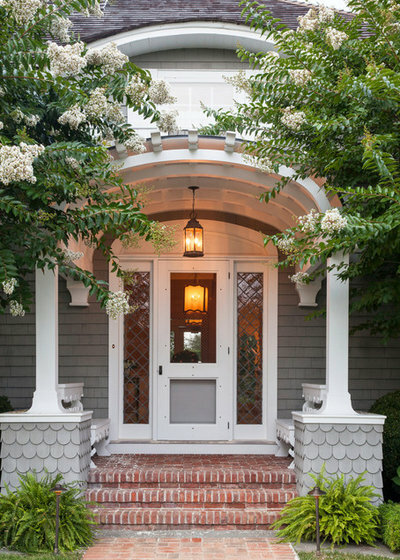 Scalloped shingles and leaded glass lend a storybook feeling to this entry on Long Island, New York. 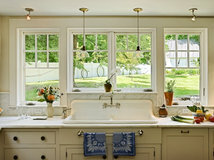 The wood-framed screen door allows the summer breeze to blow through while keeping unwanted bugs out. 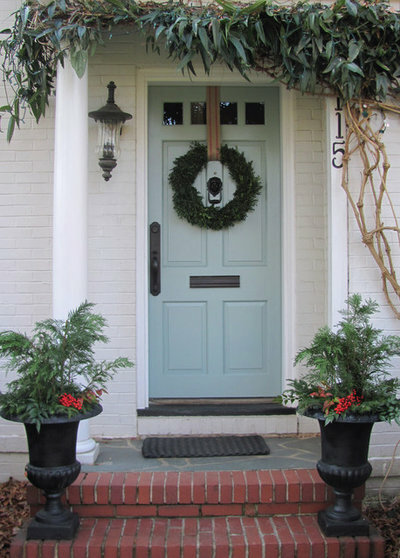 31.This cool blue door picks up colors from the lush foliage surrounding the entry as well as the flagstone entry step — it’s equally classic and fresh. J. F. Roesemann Builders, Inc.
32. 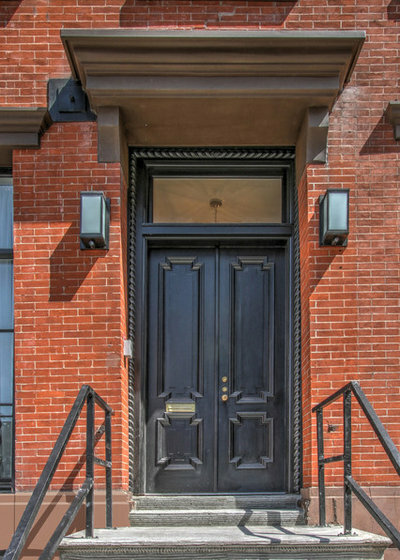 Updated lanterns flank an otherwise traditional brick townhouse in Manhattan’s Chelsea neighborhood. 33. This restored 17th-century home in Massachusetts features authentic Williamsburg colors, including sage green on the front door. 34. 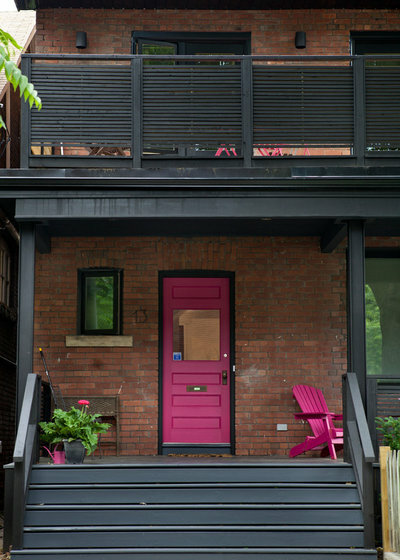 Dark gray and pink make a killer combination on this Toronto front porch. 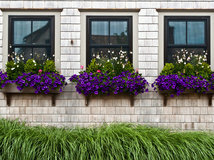 The designers at Post Architecture also painted the Adirondack chairs to match the front door, and pink flowers and a pink watering can round out the color grouping. 35. 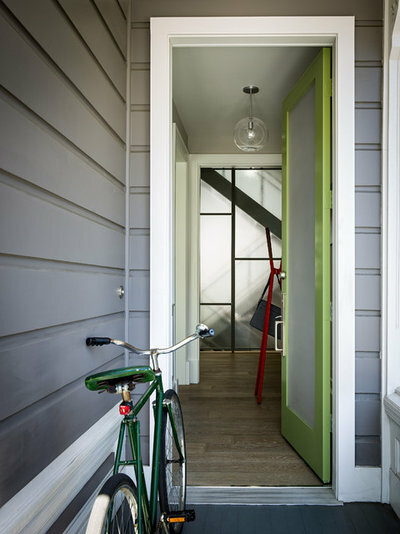 The fresh green door frame wakes up an otherwise neutral Victorian home exterior in San Francisco. 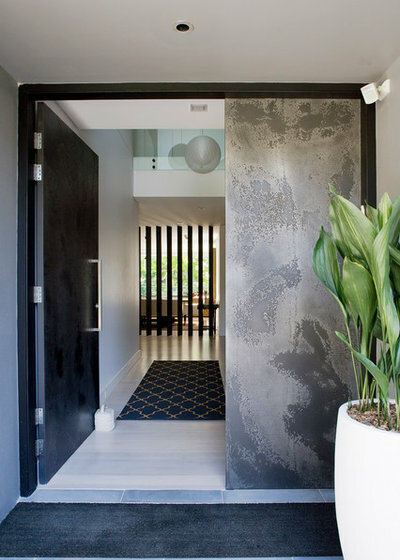 The frosted glass front door lets in light while maintaining privacy. 36. Rows of pavers and gravel complement the geometry of this industrial front door in Sydney. 37. 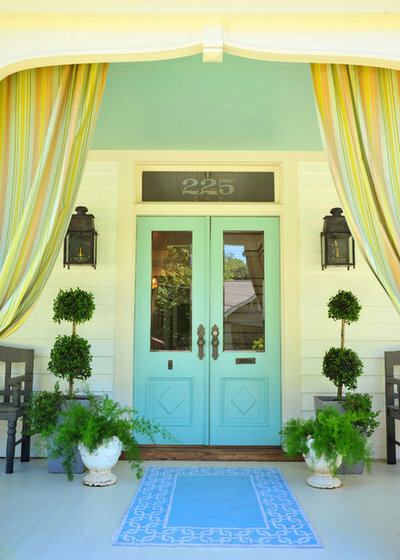 The salvaged antique double doors on this Atlanta-area farmhouse got a fresh coat of turquoise paint. With potted topiaries, striped drapes in complementary colors and a painted blue ceiling, this entry is the picture of inviting. 38. 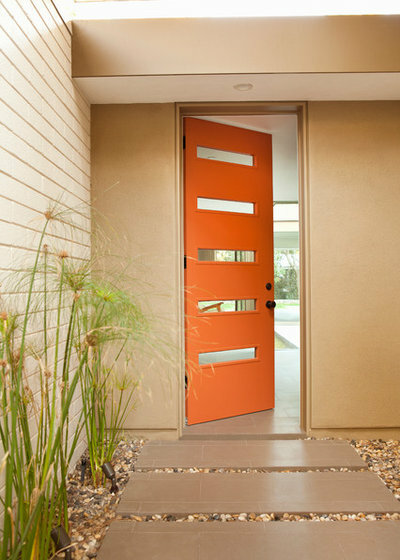 Decorating doesn’t stop at the front door — this door in Los Angeles matches the art and decor inside. 39. 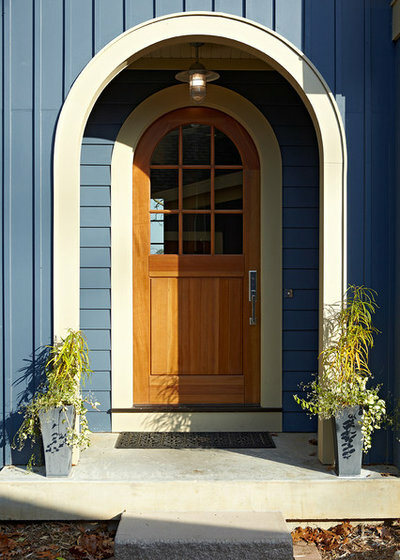 Johnston Millwork, in Redwood City, California, crafted this custom front door using cherrywood and art-glass panels from Kersey’s Glass Works. 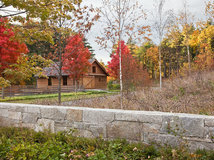 River rock inlays fill the front path. 40. 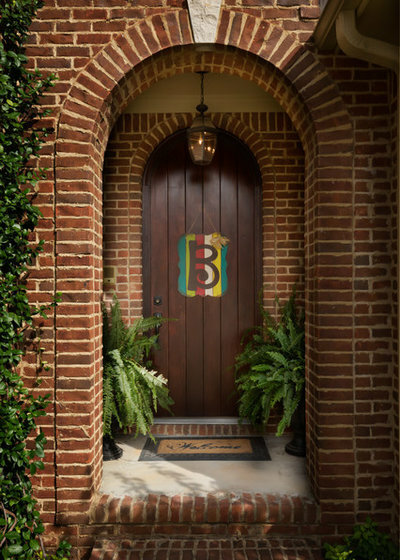 This traditional white painted brick exterior shows its eclectic side with a brightly painted front door. 41. A climbing hydrangea is all the decor this front entry needs. 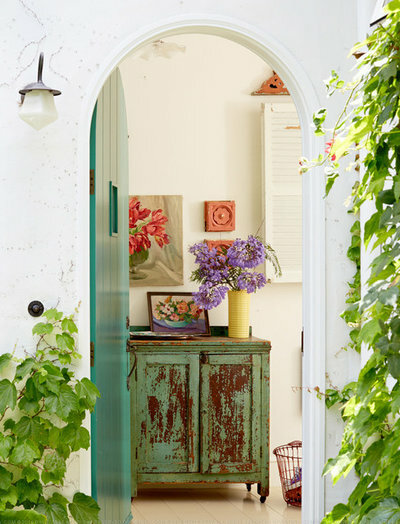 With a solid wood structure, the flowering vine frames the front door of this Mediterranean-style home in the San Francisco Bay Area, inviting visitors through the garden and into the home. 42. 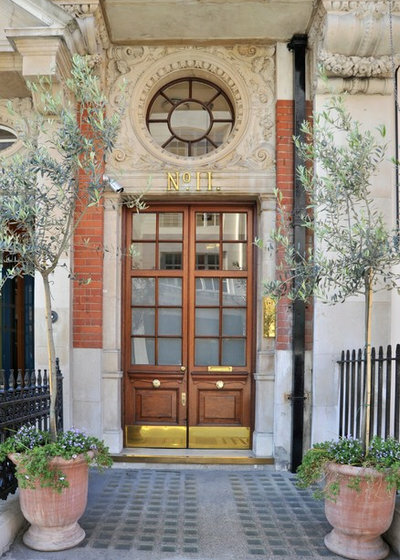 This grand entry in London features ornate carvings and a decorative address number and kick plate. 43. 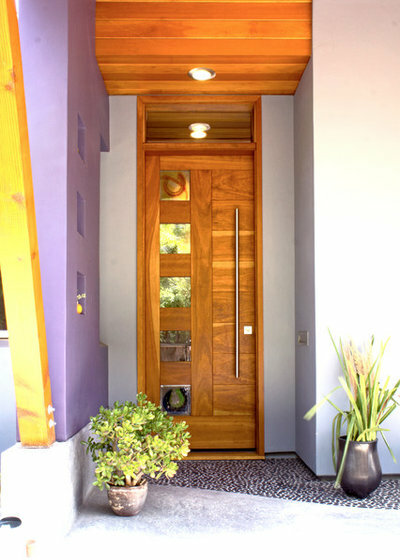 Michael Fullen Design Group custom designed this wood and glass front door in Los Angeles. 44. 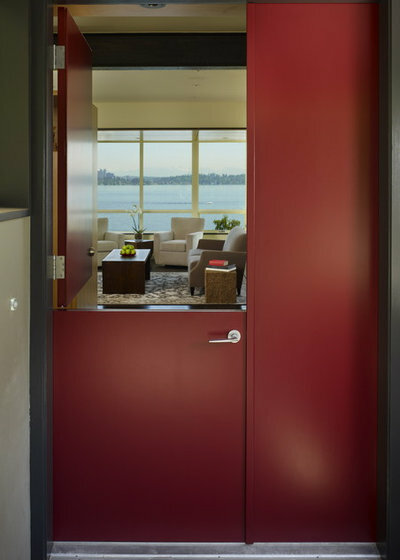 Both sides of this custom-made Dutch door can be opened, much like French doors, opening up more of the entrance to the view of the Seattle skyline. 45. 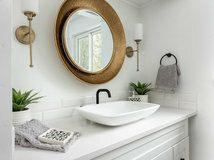 Interior designer Jessica Helgerson’s home, just north of Portland, Oregon, features simple white siding and a black front door. 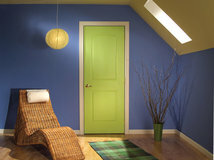 The color interest for this entrance instead comes from her planted green roof and folding Fermob cafe chair. 46. Two lush ferns and a hanging banner stand out against this mostly brick entry. 47. 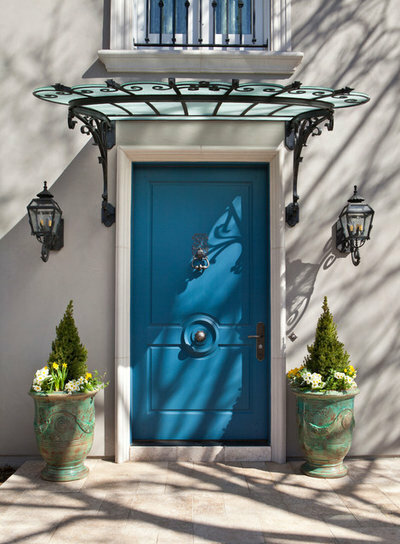 Two lanterns by Visual Comfort flank a front door that matches the metal used elsewhere in this entry. Sometimes you don’t need contrast to make a statement. 48. 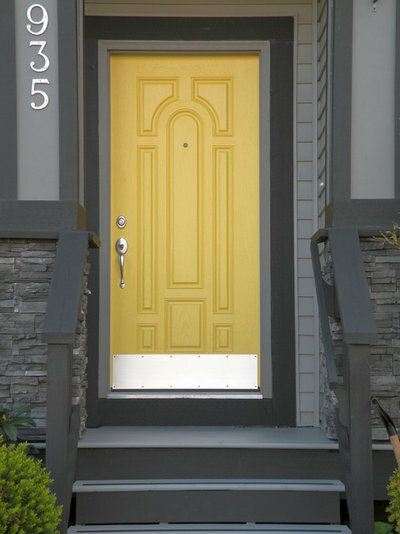 Cheery and chic, this yellow front door sure draws attention as a destination against an otherwise matte gray exterior. 49. 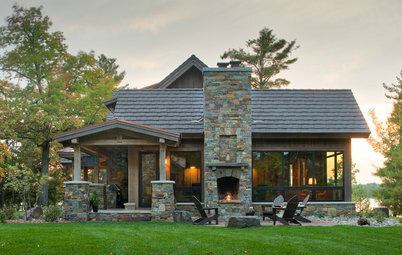 The rounded top of the door to this home on Pentwater Lake, in Michigan, mirrors the arch of the covered entry. 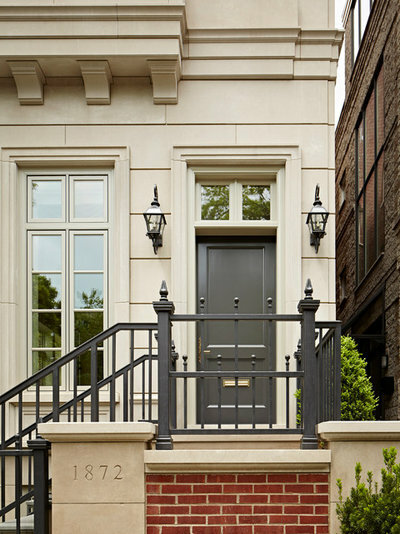 The matching trim surrounding the door and the entry arch creates a perfectly harmonized entry sequence. 50. 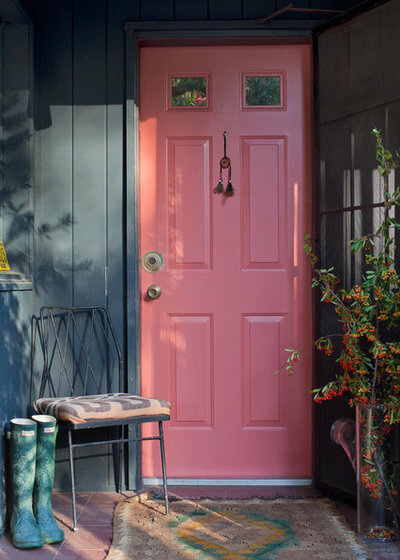 A pink front door complements the matte black siding of this home in Los Angeles. 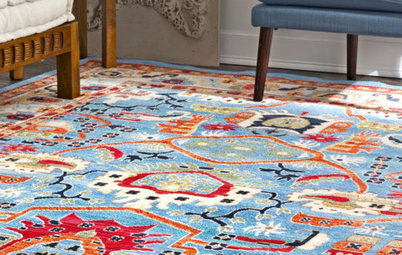 The unusual combination feels fresh, eclectic and balanced. really awesome work! Thorough & a great catalyst for entry ideas! I enjoyed looking at the lovely colors and the many ideas to complete the look!